Hydrogen (H2) is the most plentiful element in the universe. It has the highest energy per unit of weight of any chemical fuel and is non-polluting. As a compressed gas or cryogenic liquid, it is quite volatile and requires special handling. Ergenics has developed special patented metal alloys that have the remarkable ability to absorb and store large quantities of hydrogen. The hydrogen can be released (desorbed) as a gas and the alloy is returned to its original state. These "metal hydrides" provide a safe and efficient "solid state" approach to hydrogen energy storage. In addition, the energy implications of this continuously repeatable phenomenon are the basis for a wide range of commercial products. Ergenics’ hydride devices employ a variety of metal hydride alloys. These alloys are tailored to an application’s specific needs for pressure, temperature, hydrogen storage capacity, tolerance to impurities, etc. Metal hydrides begin as intermetallic compounds produced in much the same way as any other metal alloy. They exhibit one important difference. When exposed to hydrogen at certain pressures and temperatures, they absorb large quantities of the gas and form metal hydride compounds. When this happens, hydrogen is distributed compactly throughout the metal lattice. Metal hydrides represent an exciting method for storing hydrogen. They are inherently safer than compressed gas or liquid hydrogen and have a higher volumetric hydrogen storage capacity. Some hydrides can actually store twice the amount of hydrogen than can be stored in the same volume of liquid hydrogen. where M represents the metal and H is hydrogen. The reaction is reversible and its direction is determined by the pressure of the hydrogen gas. If the pressure is above a certain level (the equilibrium pressure), the reaction proceeds to the right to form a metal hydride; if below the equilibrium pressure, hydrogen is liberated and the metal returns to its original state. The equilibrium pressure, itself, depends upon temperature; it increases with increasing temperature and vice versa. The hydrogen sorbing behavior of metal hydride alloys is characterized using equilibrium pressure-temperature-composition (PTC) data. This data is determined by keeping an alloy sample at constant temperature while precisely measuring the quantity of hydrogen sorbed and the pressure at which sorption occurs. The quantity of hydrogen sorbed is expressed in terms of alloy composition, either as an atomic ratio of hydrogen atoms to the number of atoms in the base metal alloy, or as the capacity of hydrogen in the alloy on a weight percent basis. As can be seen from Figure 1, most of the hydrogen is absorbed in a region where there is little pressure change. This region of near-constant pressure is known as the plateau pressure. 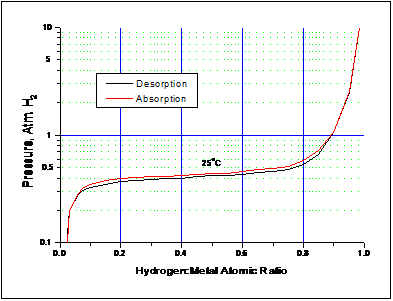 Metal hydride formation is also accompanied by hysteresis, which appears as the difference between the upper absorption curve and the lower desorption curve in Figure 1. Figure 1 – Pressure-Temperature-Composition Absorption and Desorption Isotherms for Ergenics’ Hy-Stor® 207 alloy at 25°C. When filled to capacity, Hy-Stor 207 alloy (LaNi4.7Al0.3) holds 1 hydrogen atom for each metal atom to become LaNi4.7Al0.3H6 when fully hydrided. 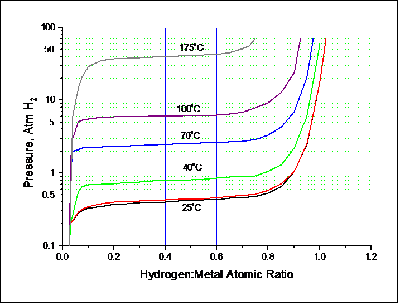 Figure 2 – Equilibrium Pressure increases with increasing temperature, as shown in these PTC Isotherms for Hy-Stor 207 hydride alloy. Hydride alloys can be engineered to operate at different temperatures and pressures by modifying alloy composition and production techniques. Before hydriding, an alloy is usually crushed to coarse particles and activated. The activation step eliminates surface barriers for hydrogen penetration. Activation prepares the alloy for repeated use to rapidly take up and release hydrogen. Should the hydrides be exposed to critical levels of contaminants (e.g. CO2, CO, O2, H2O) during H2 cycling, they can be restored by reactivation with pure hydrogen. Hydride absorption is accompanied by a heat of formation which is exothermic. In order to continuously absorb hydrogen to an alloy’s maximum capacity, heat must be removed from an alloy bed. The rate at which a hydride alloy can absorb or release hydrogen is dependent upon the rate at which heat can be transferred into or out of the alloy. Increasing the heat transfer rate allows the processing of higher flow rates. The Company's hydriding alloys absorb hydrogen when they are cold and then release that hydrogen at higher pressure when they are warm. This allows their use in thermal hydrogen compressors that are driven solely by thermal energy, as well as in temperature sensors and sensor-actuators. Likewise, when releasing hydrogen, the alloys cool off and vice versa. Using the cooling and heating properties of hydrides, Ergenics has built and patented air conditioners that are powered by waste heat and rapid heating devices, such as the Cold Start Heater for catalytic converters. Ergenics' metal hydride expertise forms the backbone of solid state, hydrogen storage units for fuel cells and other devices that need a portable source of clean, low pressure hydrogen. The Company’s patented innovations enhance the ability of its metal hydride / hydrogen storage reservoirs to withstand impure gas streams (100% humidity) and deliver high flow rates, with quicker thermodynamics and increased vessel cycle life. Ergenics' technologies have established it as the world's leading supplier of metal hydride devices.